From the 1950s through the 1980s, the Baltimore County, Maryland Fire Department bought and converted about 40 CJ-3B and CJ-5 Universal Jeeps, to use as brushfire units at stations surrounding the City of Baltimore (see a map, 340K JPEG). Many of the Jeeps were photographed by Johnny Floyd II of Royal Blue Fire Photos, who took all the photos here not credited to other photographers. Part 2 of this article looks at Jeeps operated by the Volunteer Fire Companies of Baltimore County. 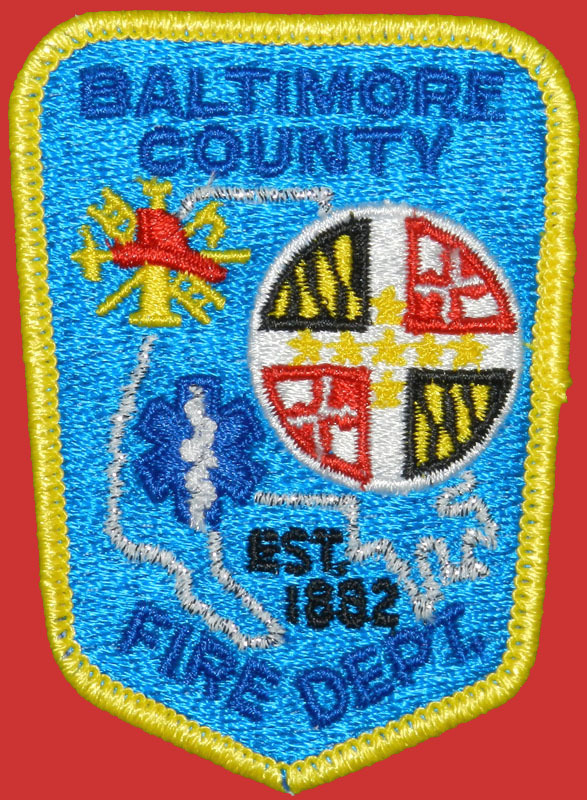 Formed in 1881, the Baltimore County Fire Department is one of the oldest county fire agencies in the United States. Since its founding it has worked together with a large number of volunteer fire companies to protect the suburban and rural area surrounding the city. As of 2019 the population is over 800,000, served by 25 full-time stations and 28 volunteer companies (see a list of stations) but in the early 1950s the population was less than half of that, and there were only 10 full-time stations. 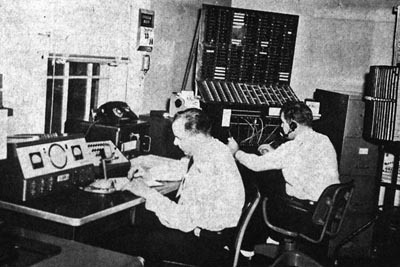 The year before the BCoFD bought its first Jeeps, Fire Engineering magazine ran an article in their October 1954 issue about Baltimore County's new radio dispatch system. The central radio dispatch facility at the new Station 1 in Towson, the county seat, is seen here. Thanks to Fire Engineering for these photos. 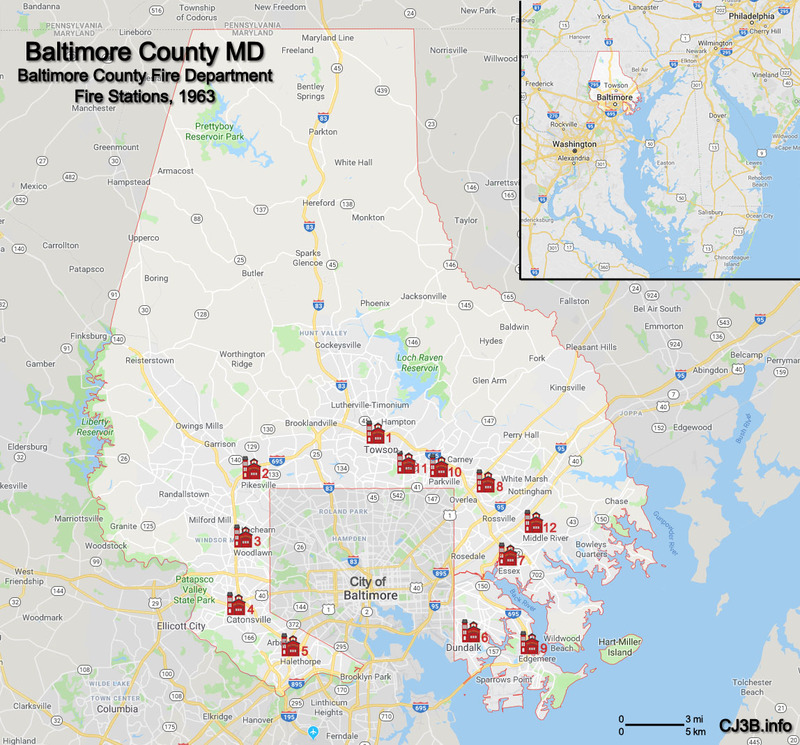 The Baltimore County radio system kept the dispatch center in contact with paid and volunteer stations around the county, and also directly with engines responding to incidents, soon including the brushfire Jeeps. At the time, BCoFD had 15 engines, one ladder truck, one tanker and six ambulances, at 10 stations (see the map). In addition, there were 31 volunteer companies spread more widely around the county. Crews at a fire could also be equipped with "Handie-Talkie" radiophones to stay in touch with incident command. 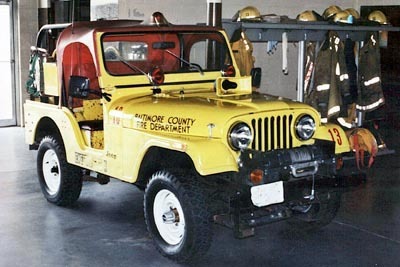 Meanwhile, the Department had no doubt noticed that some of the volunteer companies in the county were using Jeeps for a quick response to grass and brush fires, and shortly after equipping all their apparatus with radios, Baltimore County decided to add a Jeep to the roster at each of the 10 stations. 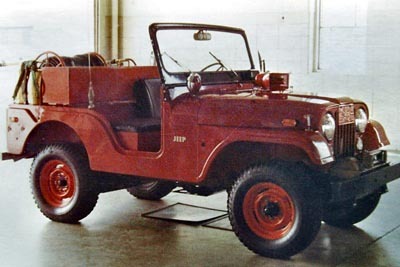 The first 10 Jeeps were 1955-57 CJ-3Bs, modified by the Department's own shops. The only photo I have found is this one, with the "J-10" license plate indicating Jeep 10, assigned to Station 10 in Parkdale. 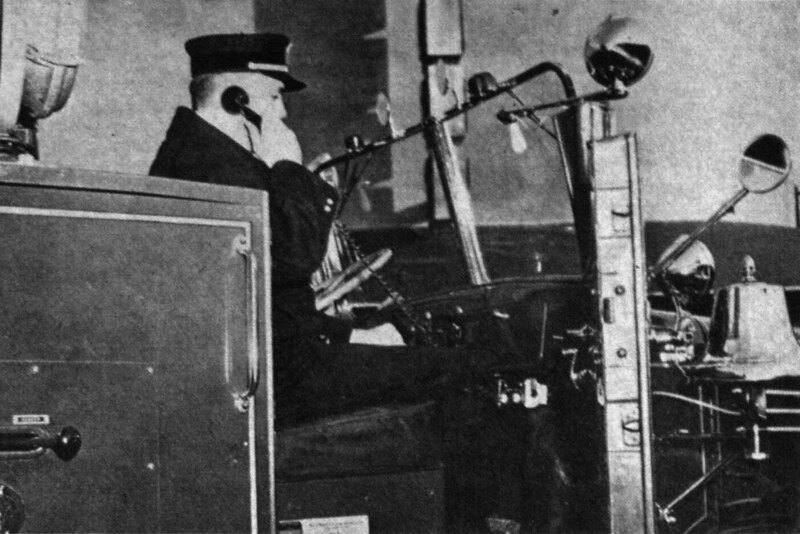 The photo shows the radio antenna, and a box mounted in front of the radiator guard, which couldn't have been helpful in engine cooling. It encloses a 10 GPM John Bean pump, pulley-driven from the crankshaft and pumping from a 60-gallon water tank. 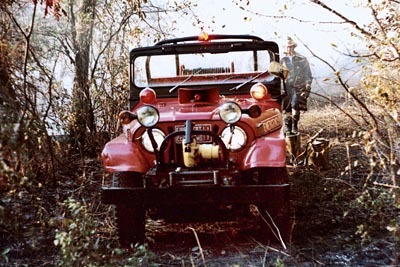 Records also show that BCoFD had a 1957 Willys CJ-3B used as Floodlight 1. 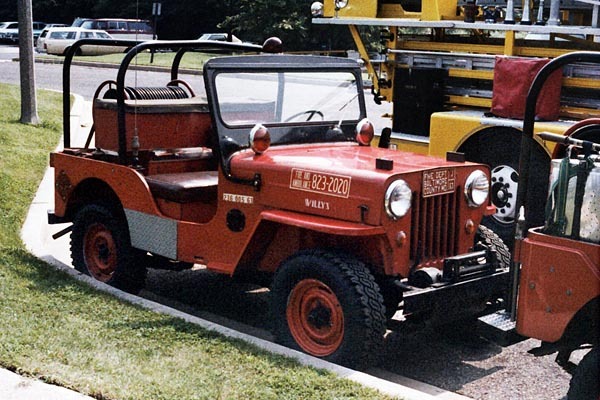 Several more examples of this distinctive design which I call the "Baltimore County Willys" were built as replacement units in the early 60s. This photo by Walter Gleitsmann shows what I think was one of those replacements, after a roll cage was added and it was re-numbered J-64 as a reserve unit in the 1970s. This angle gives a good view of the John Bean pump (140K JPEG) which now was more suitably protected by steel mesh rather than a box. Stations 11 and 12 were built in the early 1960s in Hillendale and Middle River (see the map) and equipped with new CJ-3Bs converted by the county shops, with a revised pump design. 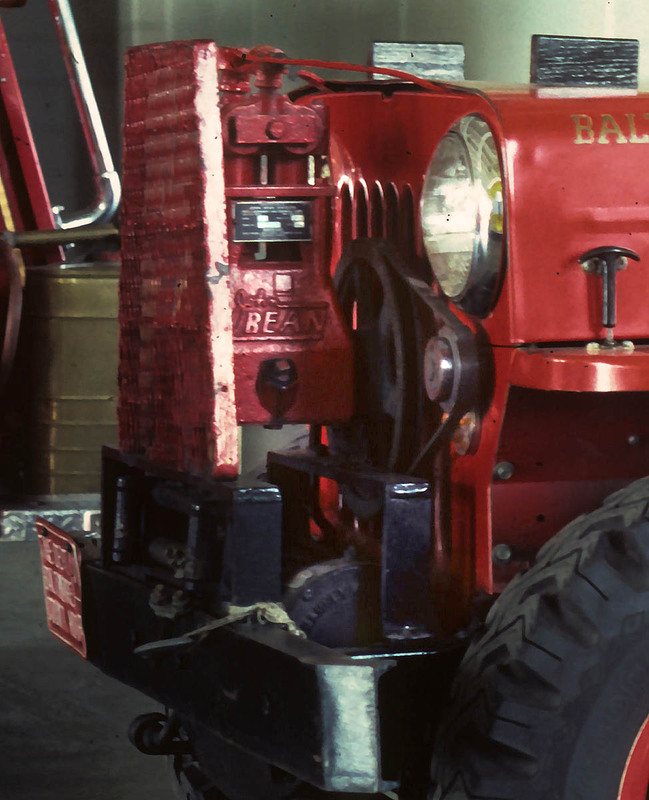 A belt-driven 10 GPM Panama pump was mounted under the hood, and activated by a electric clutch switch on the dash. Backpack pumps are mounted above the rear wheelwells on Jeep 11, seen at Hillendale Station in a photo by Jim Atkinson. Records indicate that Jeep 63, seen here in the late 1970s after being re-numbered as a reserve unit, is the same CJ-3B from Station 11. 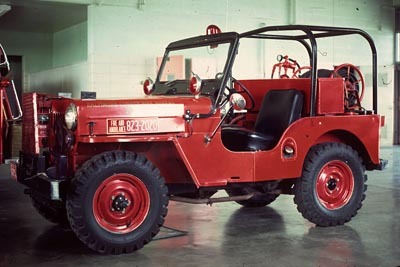 An equipment locker and large hose reel sat on top of the water tank, and in place of a passenger seat, the Jeeps had a bench installed above a box holding the radio equipment. 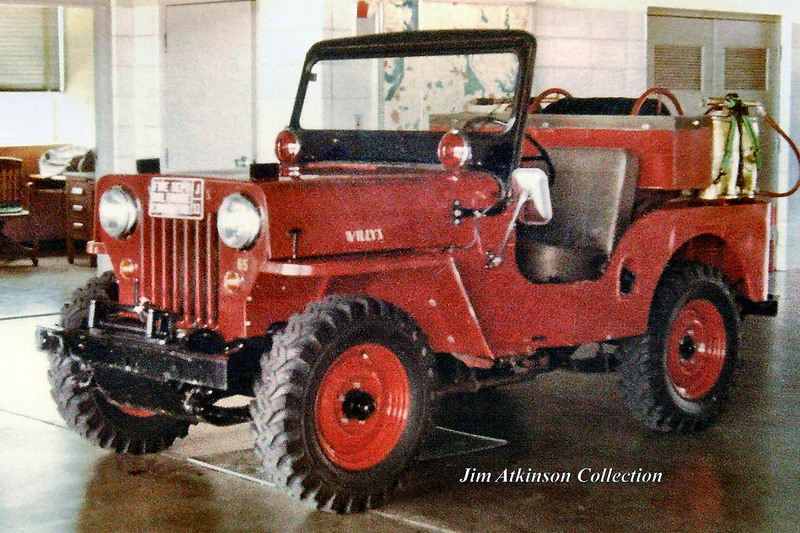 There were about 15 Willys CJ-3B brush Jeeps built by the shops from 1955 to 1964. They provided the BCoFD with capable brushfire units at a relatively low cost. 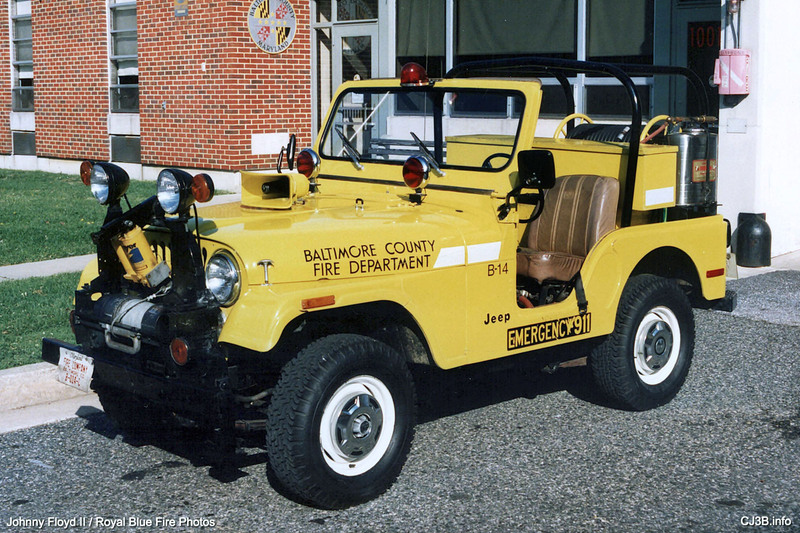 In addition to the economical cost of the "Baltimore County Willys", its small size was another advantage. The stations were single-bay or two-bay buildings without much room to store vehicles, so the Jeeps were often squeezed in between an engine and an ambulance or a reserve unit. 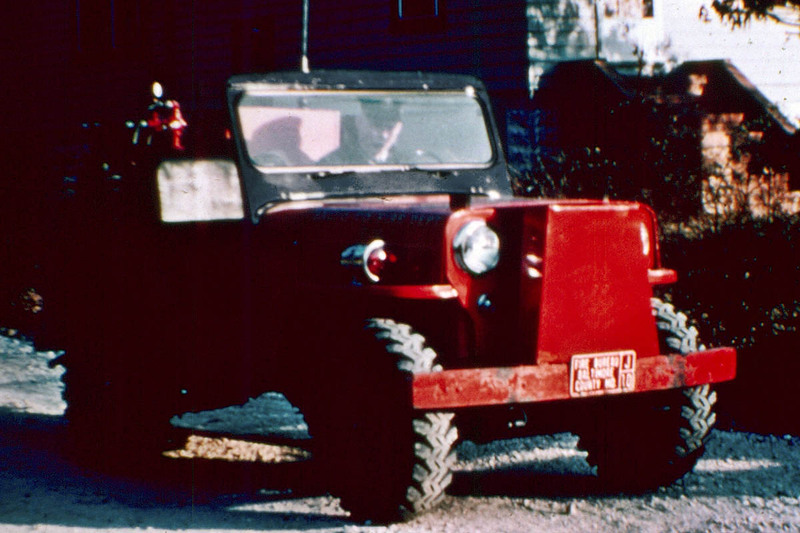 One of the 60s CJ-3Bs is seen here re-numbered as reserve Jeep 61. This picture was taken shortly after the activation of 911 dialing in Baltimore County in January 1980. 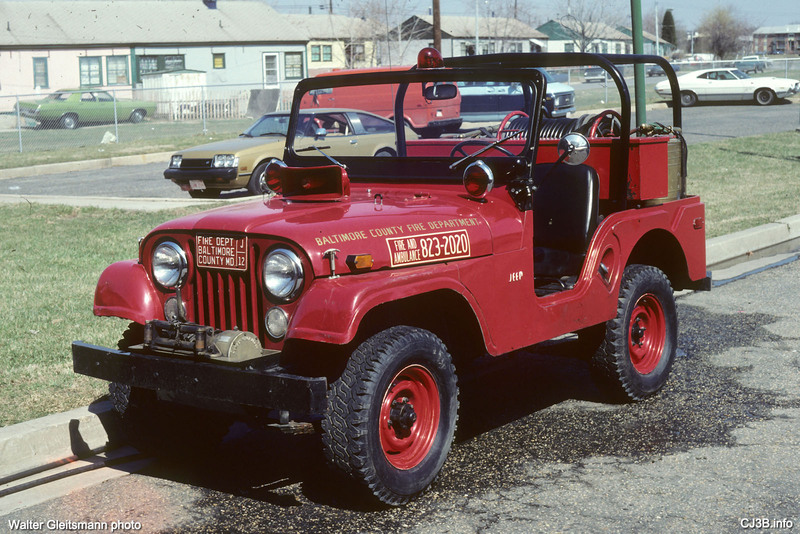 The CJ-3Bs at Stations 1-12 were gradually replaced with new, similarly equipped CJ-5s between 1966 and 1976. Meanwhile, as urban development spread further outside the City, Stations 13-19 were built and also given new Jeeps. 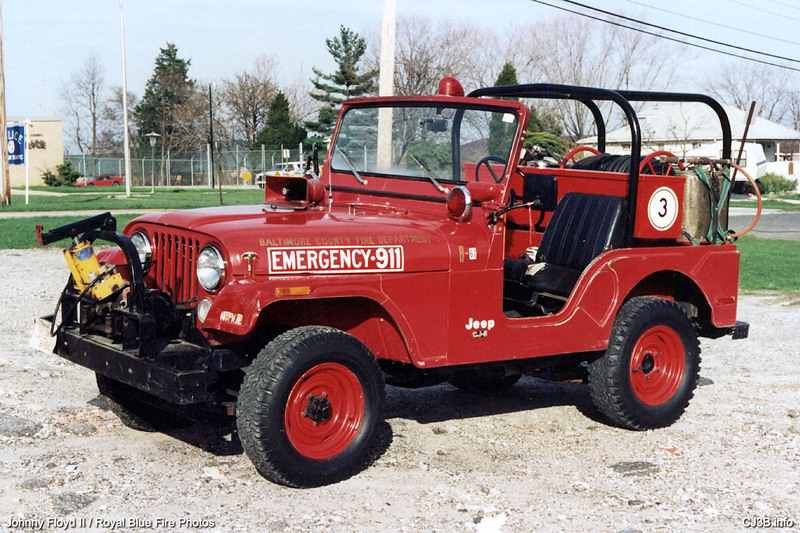 Station 12 at Middle River got this 1969 Kaiser CJ-5, one of the last before Jeep Corp. was sold to American Motors. Thanks to Jim Atkinson for the photo. 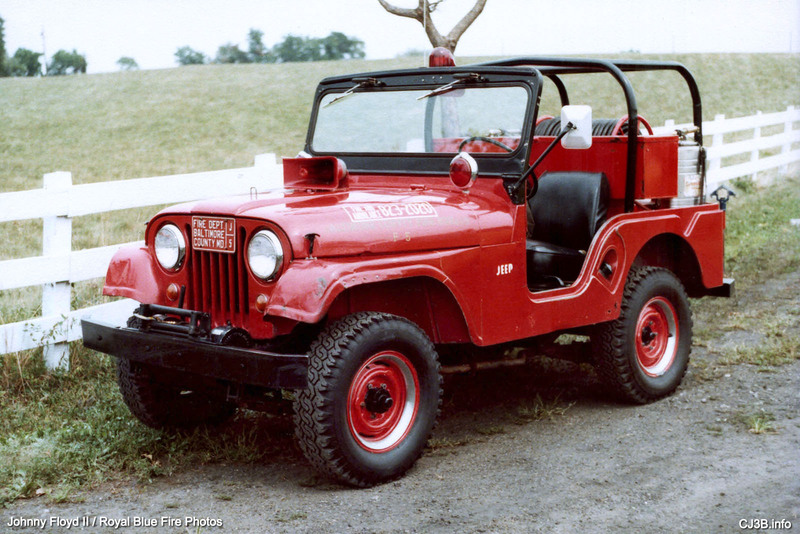 The same Jeep 12 was photographed by former member of the BCoFD and long-time apparatus buff Warren Gleitsmann, shortly after the shops added a roll cage. One shortcoming of the Jeep conversions was that the water tanks were unbaffled, allowing water to slosh back and forth, and making road handling tricky. Warren says the shop-built roll cages were added to all of the Jeeps in the early 1970s after a couple of accidents. Jeep 7 is seen here in action in a photo by Johnny Floyd II. 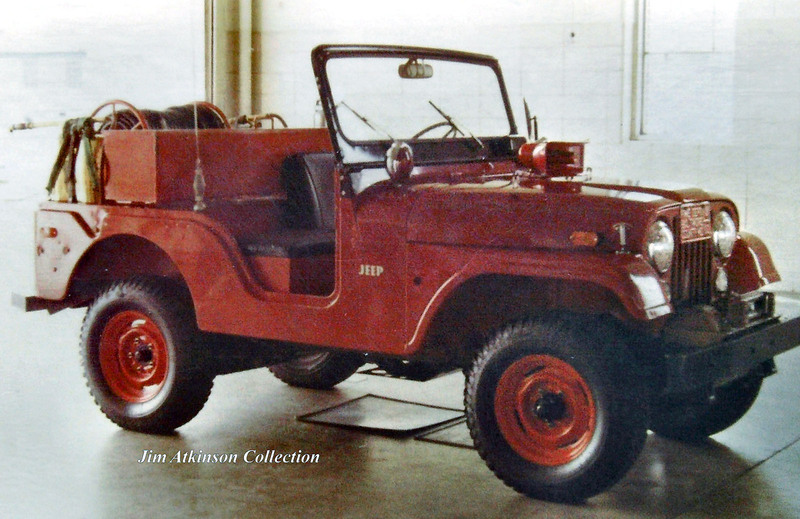 Warren Gleitsmann says, "The Jeeps built in the 60s had four cylinders and were quite a handful, especially to get stopped. The ones built in the 70s and 80s were better to stop, but with six cylinders you had to be careful because now you could get some more speed, and with unbaffled water behind you, handling became an issue. The Jeeps were very good in the woods once you got them there, and pretty dependable." 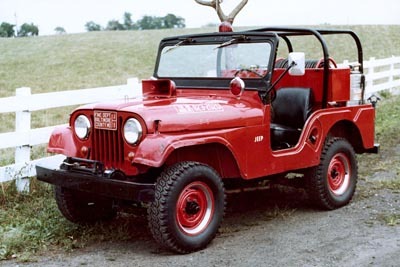 Although the Jeeps were clearly well maintained, and various stations added their own touches like hubcaps or beauty rings on the wheels, they were not babied. In this photo, the 1966-vintage Jeep 5, like many of the units, shows front fenders which indicate it has been out in the bush frequently over the years. 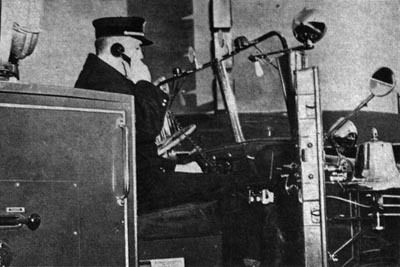 The 823-2020 sticker shows that this photo was taken prior to the activation of 911 service in 1980. All the Jeeps had a passenger bench on top of a box for the radio equipment. This originated back when a passenger seat was optional on CJ-3Bs, but was retained even when it required pulling a seat out of the CJ-5s. The early AMC-style "Jeep" logo on the cowl of Jeep 19, just behind the connector for the onboard battery charger, indicates an early-70s model. It's seen here at Station 19 in Garrison, in the 911 era. 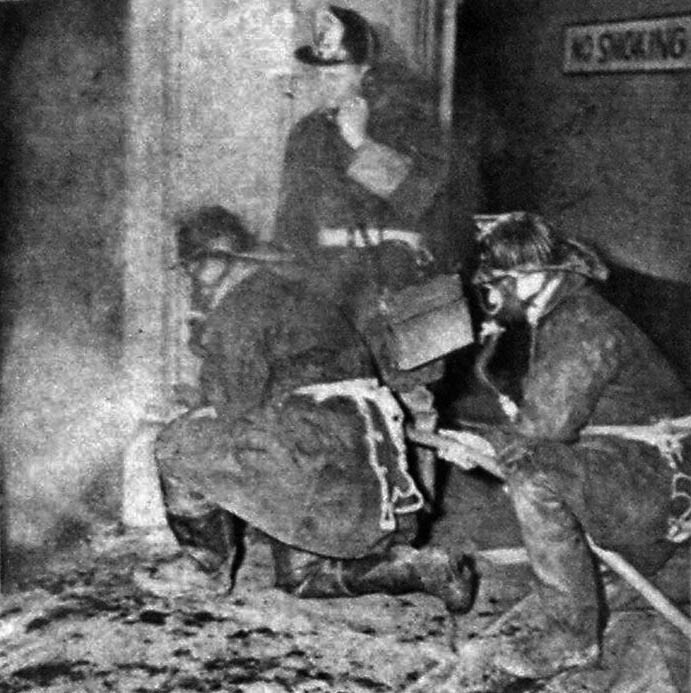 Truck 75 in the background was a 1949 Seagrave ladder which was in reserve until 1982. This 1974 CJ-5, which served at several stations before ending up as Brush 3 at Woodlawn in the 90s (see the map), was one of the last of the BCoFD Jeeps to retire. 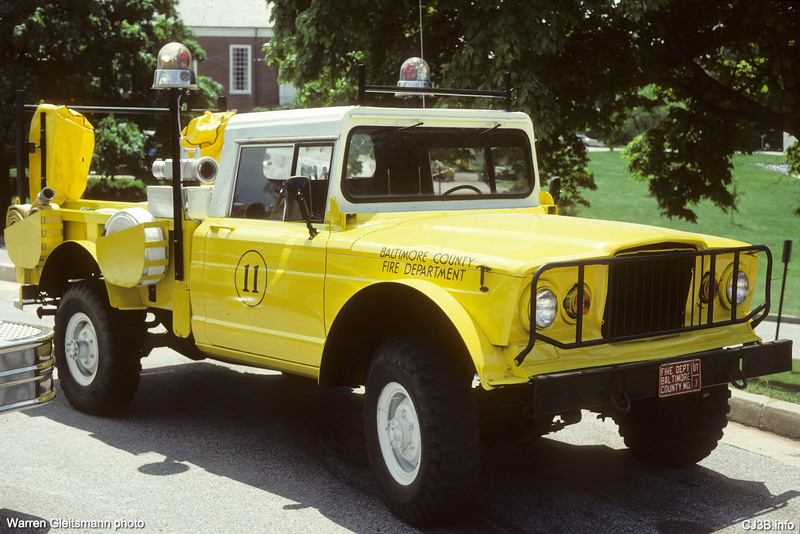 The Department switched to yellow paint for its apparatus in 1976, but the existing Jeeps were not repainted yellow, and a few were still in service or on reserve when the Department returned to red (and white) in 1988. Warren says, "They all started aging quickly in the mid 1980s, especially the ones bought prior to 1974." 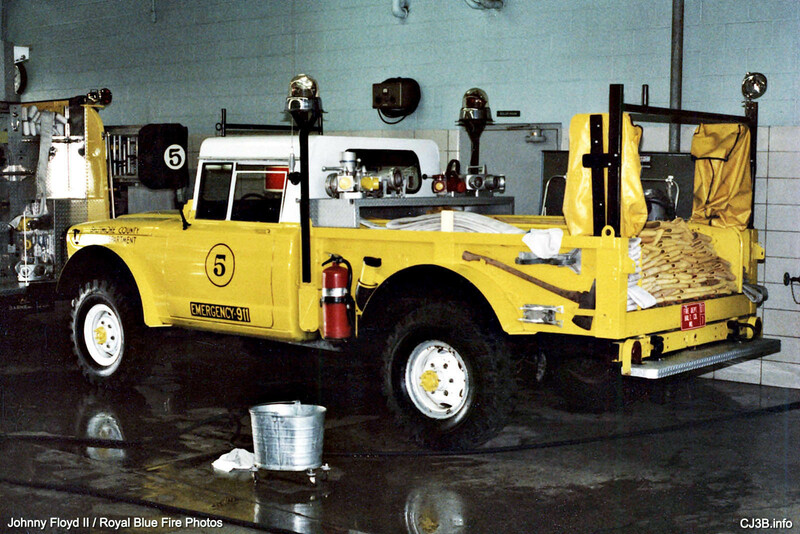 Station 5, 13 and 14 received replacement CJ-5s again in 1981. 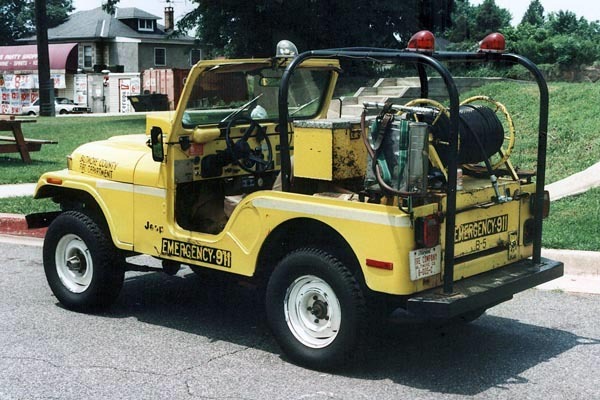 These were the last replacement Jeeps and the first to be bought in the yellow paint adopted in 1976. The design and equipment on the last Jeeps remained pretty much identical to those built in the 1960s. This AMC CJ-5 joined the roster as the new Brush 5. The rear view shows the mounts for a couple of backpack pumps, and the roll cage serving as a handrail for the back step. Brush 14 was another of the final group of Jeeps acquired in the early 1980s, before the Department re-standardized on larger Chevy S-10 pickup trucks, with Darley slide-in pumps, for their brush units in 1987. Brush 13 was a 1981 CJ-5, which sported a vinyl top stretched over the warning beacon, when this photo was taken at Station 13 in Westview. 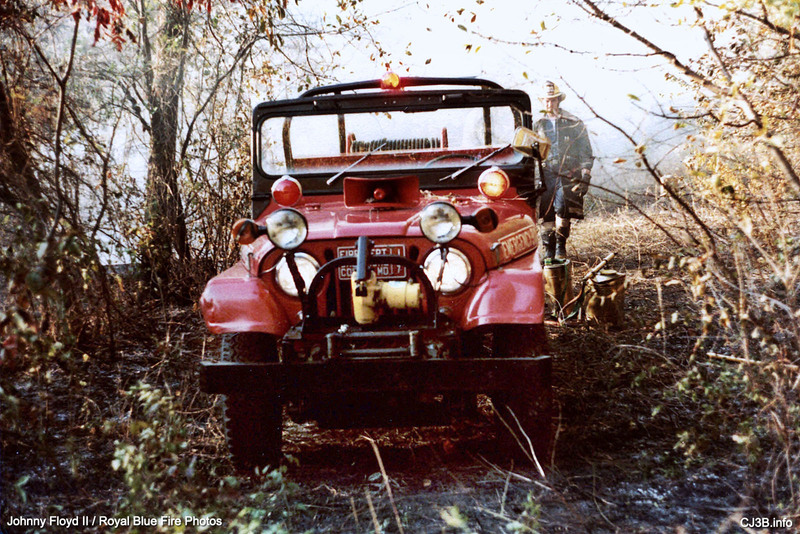 Station 54 opened in 1982 with a new CJ-5 (the only Jeep with an enclosed cab,) bringing the total of CJ-5s purchased over the years to approximately 24. 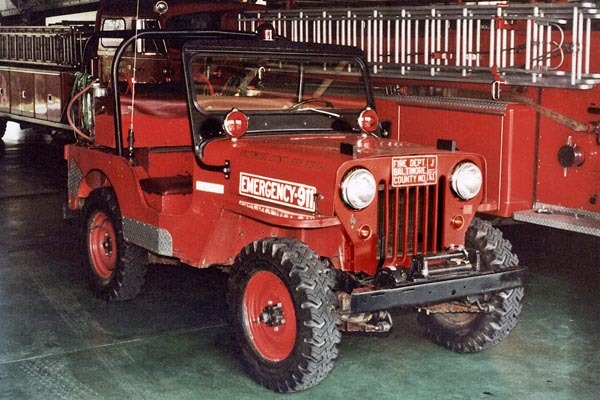 The last CJ-5 was retired from service in 1997. 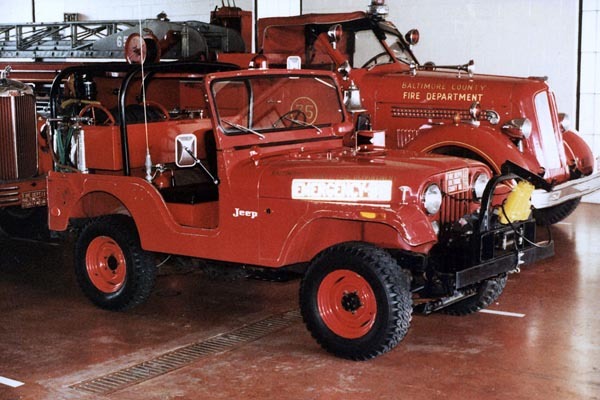 The Jeeps were generally in pretty bad shape when sold as surplus, although some went to work for the Fire Department maintenance shop, or other county departments. 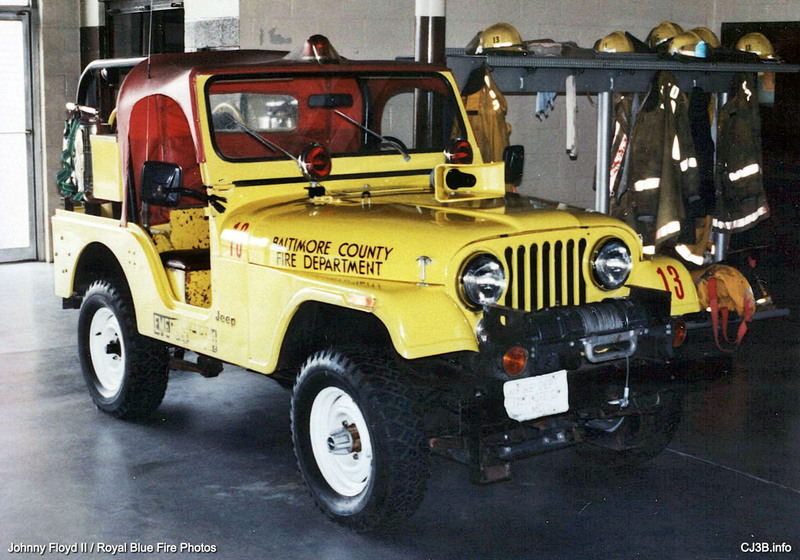 A footnote to the Baltimore County Jeep story, is a trio of Kaiser Jeep M715 trucks. 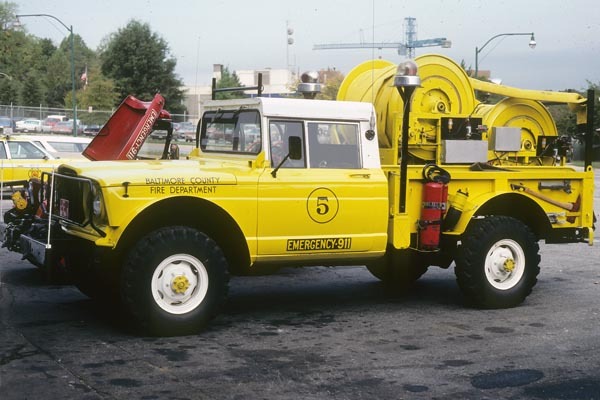 Most fire departments that received these late-sixties 1-1/4 ton Army surplus trucks turned them into brushfire units (see Kaiser M715 Fire Trucks). However, BCoFD used them as hose wagons and designated them as Special Units 5, 11 and 12. Thanks to Warren Gleitsmann for these photos. The Special Units carried 1,000 feet of 4-inch hose, plus additional 2-1/2-inch hose and accessories. Seen here is SU11 (licensed as UT-3) which was reassigned to Station 12 after SU12 was wrecked in 1984, and stayed in service until 1990. 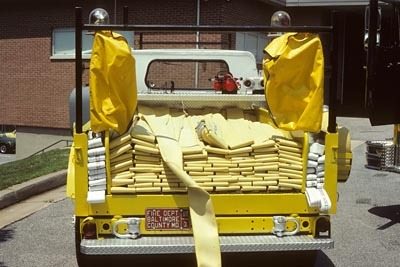 BCoFD had planned to build more of the hose wagons, but the next batch of surplus trucks were older Dodge M37s not considered suitable, and by the late 1980s the Department moved away from the idea. On Special Unit 5, the shops took advantage of the M715's five-quarter ton rating, by installing two huge hose reels. 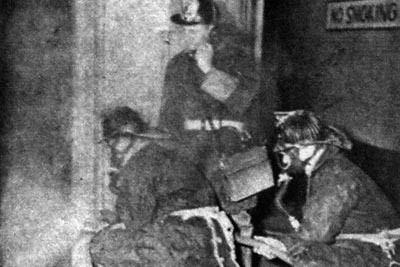 The experiment, inspired by a similar unit at the Woodlawn Volunteer Fire Company, was problematic in operation, and the reels were later removed (250K JPEG). SU5 was taken out of service in 1986. Note: in the background of Warren's photo, one of the red CJ-5s is being serviced. Continue to Baltimore County, Part 2: the Volunteer Companies. Thanks to Johnny Floyd II of Royal Blue Fire Photos for many of the photos on this page.